Description: Caespitose perennial to c. 0.5 m high, shortly rhizomatous. Leaves with ligule truncate, firm, 0.4–1.5 mm long, ciliate with hairs 0.05–0.15 mm long; auricles absent. Panicle exserted, contracted, sparse with 8–12 spikelets, 5–20 cm long; blade tightly rolled, 1.5–3.5 mm wide, strongly ribbed and densely scaberulous on upper surface, margins scabrous. Spikelets gaping, 20–25 mm long (excluding awn). 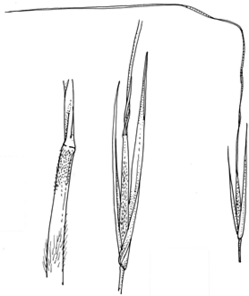 Glumes subequal, acute to acuminate. Lemma 12–15 mm long, scabrous with minute tubercles, silky with hairs 0.5–1 mm long; coma and lobes absent. Callus weakly bent at the tip, densely silky. Awn twice bent, 8.5–13 cm long, scabrous; column 5.5–7 cm long, 4.5–6 c. to the first bend. Palea equal to the lemma. Distribution and occurrence: Grows in alpine and subalpine grassland; south from Brindabella Ra.